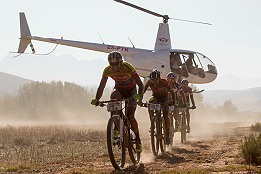 LiveU video transmission solution used in South Africa for MTB race. Cape Town, South Africa, and Hackensack, NJ, March, 2018: The world’s most televised mountain biking race, The Absa Cape Epic, has teamed up with LiveU to provide live coverage of the 8-day mountain bike stage race in South Africa’s Western Cape. The Prologue and Grand Finale will be broadcast live on TV, with the Grand Finale being broadcast in more than 50 countries around the world. During the intermediate days, a full live streaming broadcast of the racing will be streamed online to the Absa Cape Epic’s Facebook page. The event will take place from 18th – 25th March. LiveU’s LU600 HEVC portable transmission solution was chosen by the organisers due to its superior video quality and reliability. The LU600 HEVC units will be used on e-bikes (electric bikes) connected to GoPro cameras along the route, motorbikes and in helicopters together with LiveU’s Xtender remote transmission device. LiveU’s servers will be installed in OB trucks with direct connectivity to the Internet in the race villages, thanks to the race’s headline sponsor and technology partner, Dimension Data. LiveU will also provide behind-the-scenes coverage in the village, for example interviews with the cyclists. Top professional and amateur mountain bikers from around the world come together every year and compete in teams of two. Participants include successful athletes and sports people from different fields, such as Formula1, motorcross, rugby, cricket and Ironman. The race is owned by IRONMAN ®, part of Wanda Group. LiveU’s local partner Telemedia will provide onsite support during the event.